Here is a short video of the trip. This was fantastic fun for our first self supported bike trip. All the preparation was well worth it, with no problems with the pre-booked accommodation and travel arrangements. Brompton S6-R in Turkish Green for S.
There were certainly some raised eyebrows when we suggested using Brompton foldabable bikes for our trip but I have no regrets. The ease of travel with bikes folded in their Folding Bike Case Rucksack , gave peace of mind with always having the option of catching a bus or train. We were travelling along the valley so there were train stations all along the route . Since we had never ridden these bikes prior to the trip they are remarkably easy to ride. The small wheels made them twitchy initially but once used to it the manoeuvrability was a bonus. The canal path along the Garonne canal is paved all the way so it was very smooth. Even on the slightly bumpy bits they seemed quite comfortable. Buying the bikes over the Internet from a bike shop in Dorchester, UK proved easy and everything worked without a hitch. Ergon GP3 Barends The bar ends helped significantly with comfort. The saddles we chose were Brooks B17 Specials. The worry was that you read that it takes 200kms to get used to. Initially S had some discomfort but this was resolved by angling it down a little. We had a maximum of 60 kms on one day and our rear ends survived without too much trouble. We look forward to wearing them in a little more. I bought the Cyclone 3 Trekking trailer for our luggage as we had quite a lot to carry with both of us having to attend formal conferences at the beginning and end of the trip. This is very capacious and I didn't notice it at all on the flat. It may be a bit more of a problem going up big hills. 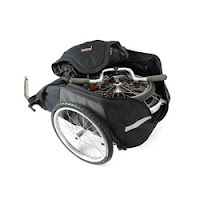 A better trailer for the Brompton is the Cyclone IV Chubby which has now become available as it is made for the Brompton. Luggage was for me the Brompton Touring bag, and for S the S-bag. They were half full most of the time with the trailer taking most of our stuff. I think in future, if we do this again, we will go for smaller front luggage for both. The bike handles really well with the trailer and could still do the first fold with the trailer still attached when stopped. Although this trip was only 200kms over about 4 days, it was our first effort at touring. As we near retirement we look forward to many more of these trips in the future. At this stage it looks like Tasmania in September! !